When a man points a finger at someone else, he should remember that [three] of his fingers are pointing at himself. We blame the victim. In this case, that’s the 99 percent. The 99 percent continually allows the swindle. Rarely have we not swallowed the bait, complicit as we are in our own oppression. Time and again we choose oppression over freedom. For what? Bribes – wealth, luxuries, “looking good,” and, most commonly “safety and security” and the semblance of “peace, prosperity and democracy”. What a crock. We, the 99 percent (which includes this author) fail to see, understand and neutralize strategies oppressive governments use to divide us. By “governments” I mean powerful people who successfully concentrate power then use that power to control everyone else through force, fear, propaganda, fraud and criminal acts. So we are The Confused. Dizzy Bat Players. Drunk on relative wealth, we spin around dazed, attacking each other instead of unifying to create a world where freedom truly rings. Just when we start to awaken, we take another swill of mind-numbing propaganda from the “right” or the “left” while relay racing on the hedonic treadmill. What strategies has the 99 percent willingly ignored in return for crumbs? This one, in which Plutocrats created the “white race” thereby dividing the poor and middle classes by skin color in order to conquer them. Long read, but worth every word. This one, which justified WWI involvement. It is commonly known the US government provoked Japan into attacking the United States During WWII. This one revealed when a civil jury found the government guilty of the wrongful death of Dr. Martin Luther King, Jr. Essentially “our” government assassinated him. The American Central Intelligence Agency has been complicit in “destabilization” activities for purely economic reasons in many countries (Hat toss to Carl Herman for his excellent accounting). Is it too far a leap, given all this evidence that all the assassinations in 1968, King, Jr., the Kennedy’s were orchestrated by government? Could 911 have been an inside job too? False Flag campaigns got us into major conflicts, including Vietnam, why would government stop in the 60s? I was once part of the unbelieving masses. I once lived my as a dizzy bat player: I believed in our government as a benevolent force for good in the world. I served in the military. Today we can see the world as it is. History seems clear. It’s time to disclaim victimhood in exchange for positive action leading to empowerment and permanent change. We don’t ask that you blindly join us. Just realize your apathy is compliance. Own it. Granted, doing so requires self-confrontation. Not everyone is ready. Not everyone is needed. Not now anyway. For those who are in action: there are things to be done. Clearly, in days of old, demonstrations and public outrage failed. Had they succeeded we would not be seeing what we see today. Incremental change is one thing. When it happens under the hood of oppression, it is a crumb. Indeed, government has so powerfully rebounded, we now find the 99 percent nearly impossibly mired, unlikely to mount any meaningful revolution peaceful or otherwise. Get committed internally to making change happen. The time for complaining is near-over. Soon, we’re going to have to take real action. To do that, you’re going to have to get out of your comfort zone(s). The only permanent solution is ridding civilization of government and capitalism. Period. Forget in-the-box thinking depending on government to “do the right thing”. It won’t. While the Tea Party may seem to have an agenda least-aligned with the 99 percent, their tactics are worth looking at. Forget about waiting for collapse to happen. Expecting a positive solution will fill a power vacuum collapse crates ignores history. Instead, start now examining alternatives to government and capitalism including transition plans to get from here to there before the collapse. Get over your fear of death. Harder said than done, we know. If you’re reading this, odds are against you living indefinitely. Fear of death is easily manipulated meaning you can be controlled. You may not have to face actual death. Still, getting over that fear opens possibility. Hone your critical thinking skills. This includes examining knee-jerk responses determining your world view. Is the 1% really evil? Really? Are GOP members really out to destroy the middle class and enslave the poor? Are Democrats really out to socialize America? Really? Hone an ability to remain calm. Again, easier said. People in upset are easily manipulated and easily defeated. Developing an unshakeable spirit is paramount given the road ahead. 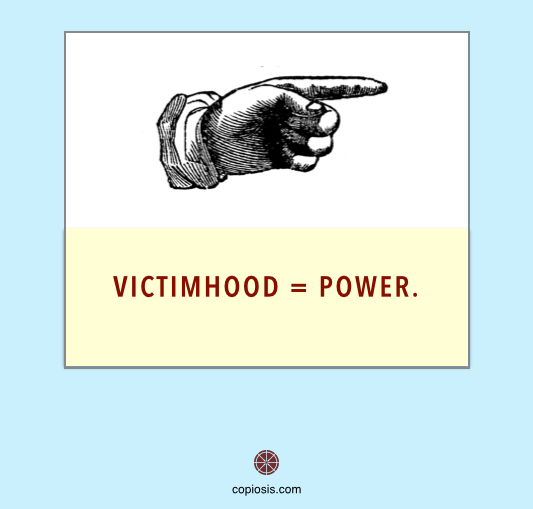 Victimhood = power. Victimization begets opportunity to regain ones’ power. Shaking off powerlessness begins when you own your role in the perpetrator/victim dynamic. Thus begins the first step to a new world. Calmly, but boldly is how we create the world we wish to see.